These are the sickening injuries a 79-year-old great-grandad suffered after a disqualified, uninsured hit and run driver ploughed into him as he crossed the road. 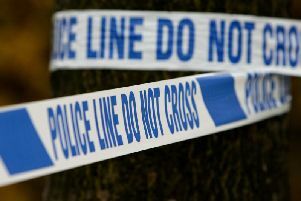 Traumatised pensioner Jimmy Booth was left unconscious on Great Greens Lane in Clayton Brook, near Bamber Bridge, after being hit by driver Jamie Parkinson. Parkinson, who was subject to a suspended jail term at the time, is now beginning an 18 month prison term after jurors found him guilty of aggravated vehicle taking. He had already admitted driving without due care and attention, failing to stop after an accident, and driving while disqualified and uninsured. Mr Booth, a former BAE worker, who has been left battling sight problems, said he is still afraid to go out after the incident. He said: “I was just going to get the bus into Preston and was crossing to get to the bus stop. I could see the car in the distance as I went to cross - but suddenly it was on me. The father-of-five said he was helped by an 11-year-old boy who called the police. Since the ordeal in June he has had his hip strapped up and still has problems seeing out of one of his eyes. Preston Crown Court heard how Parkinson, 28, of St Edmund’s Street, Great Harwood, East Lancashire, was at his brother’s house when his brother’s partner asked him to nip to the local shop. She gave evidence saying she had expected him to walk as he was already banned from driving - but instead he took the keys to her Vauxhall Corsa. Moments later he struck Mr Booth as he crossed the road. Parkinson fled the scene and returned to her home and admitted there had been an accident. The owner of the car contacted the police after seeing the damage to the windscreen. In evidence, Parkinson tried to claim she had given permission for him to use the car and alleged she was lying because she wanted to make a claim for the damage to her car. But jurors found him unanimously guilty of taking her car without consent. Recorder Nicholas Clarke QC sentenced him immediately after their verdict. Mr Booth’s daughter Jackie Barnes, 56, from Fulwood, Preston, recalled how she was told the horrific news by her husband while she was visiting her son. Parkinson was given a 33 month ban.